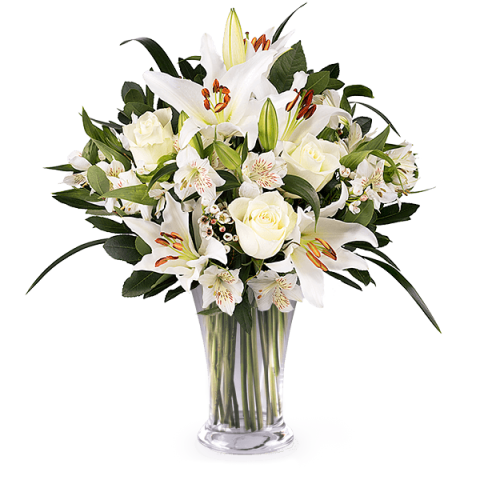 A classic white bouquet of lilies and roses to share a message of love and wow a friend or family member this year. Send it today with FloraQueen's international flower delivery to over 100 countries and make a birthday, wedding or anniversary spectacular with fresh flowers. With the summer holidays over and schools and work starting again September is often seen as a month to forget. We’re looking to change all that with flower and gift deals to make September a super month to be remembered all year round. It doesn’t matter if someone you know is celebrating a September birthday or anniversary. With our bright bouquets, exciting gifts and deals to take advantage of you can surprise a special someone with something different than the norm this month. Make September a time of positive change and renew yourself and your loved ones in the process with something extra special from our catalogue. We deliver our flowers and gifts all around the world with our international flower delivery service, so no matter whether you’re near or far, or travelling at the time. Take the chance to refresh yourself with a change this year and take the sting out of the end of summer for you and your loved one. September doesn’t have to just be a month of normality after all. Sending flowers and gifts with FloraQueen is easy too, all it takes is a few simple clicks and your September surprise can be on its way wherever and whenever you choose. We even have same and next day delivery on all our bouquets just in case you’re sending your flowers last minute too. Make this September different now.